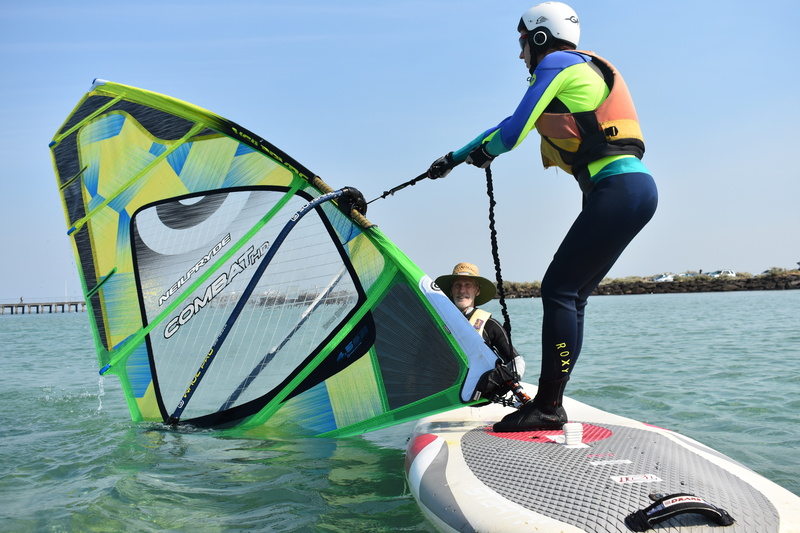 Mordialloc Sailing Club runs a learn to windsurf course throughout our regular sailing season which starts the first week of October and runs till the end of April. It consists of 6 x 2 hour sessions on a Saturday morning from 9:30 – 11:30. The course is run one on one with one instructor and one student. Individual tailoring can be done regarding dates, time and learning goals. Please contact us to discuss. Windsurfer equipment can be provided by Mordialloc Sailing club. If you have your own equipment usage of this can be discussed. Club membership provides trainees with full access to all club facilities and privileges. Initially the course will go ahead even if conditions are poor. There is plenty of theory and onshore practical things to cover. The later sessions may be rescheduled if conditions are unsuitable. This can be negotiated at the time. Please dress appropriately depending on the weather. Some days may look warm but the wind can be cold. Bathers, rash vest and board shorts are recommended on warmer days but on the cooler days a wetsuit may be required. Booties are not essential, but provide foot protection. Gloves are useful and prevent blisters. Remember to bring sun screen and a hat. Towel and clothes to change into, the club facility has showers.